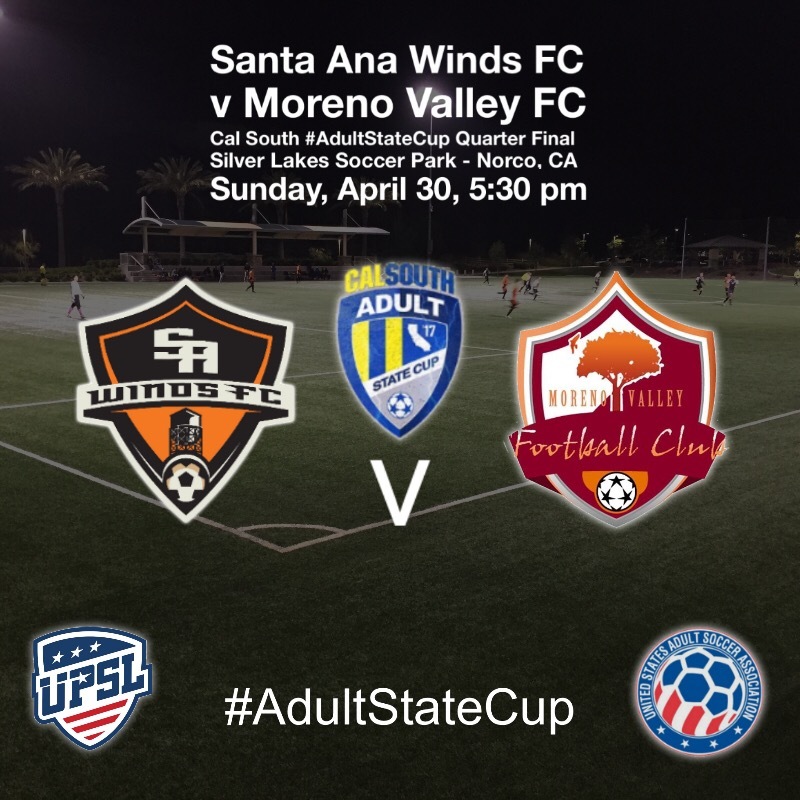 Santa Ana Winds FC will face defending USASA Region IV Champion and fellow UPSL Club Moreno Valley on Sunday at the Silver Lakes Soccer Complex in Norco at 5:30 pm, in the Cal South Adult State Cup quarter finals. The finalists qualify for the USASA Region IV championship, and the winner of that moves on to the USASA National Cup, contested by its three other regions. Theses two clubs faced each other in week 2 of the current UPSL season in a high-scoring match that went “Mo Val’s” way 5-3. Winds FC’s defense struggled in that match allowing two “soft goals,” but their offense came alive in the 2nd half, and took control of the match with a late surge, scoring 3 goals. This result vs Mo Val ended up being Winds FC’s only loss to date. Since then, they’ve won 6 in a row and sit in 2nd place, trailed by Mo Val in 3rd. A good team that keeps possession can make Moreno Valley struggle. This was made evident in their match vs La Máquina at Centennial Park in Santa Ana. La Máquina went down early on a failed clearance late in the 1st half, but took control of the match winning a majority of possession, and turned the game around to win 2-1. Winds FC will need to learn from that match, as they tend to concede a soft goal on occasion. They’ll need to tighten up and eliminate any mistakes that could prove costly in a tight knit match. Winds FC should play to their individual strengths, with their slew of players good at creating space for themselves. I don’t expect this to be a high-scoring match, a repeat of week 2, with two teams that are in their best form of the season. 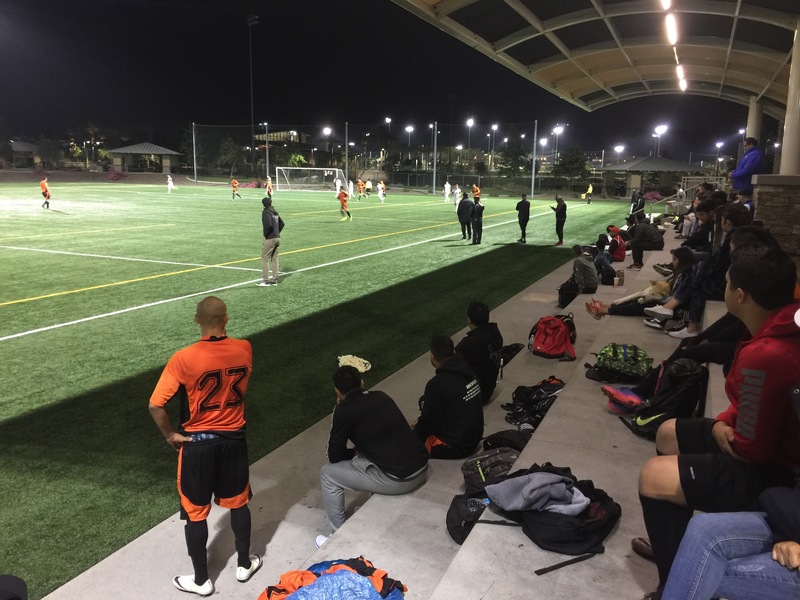 Moreno Valley topped La Máquina 1-0 in UPSL play recently, and Winds FC defeated conference leader Strikers FC in the last round of the Adult a State Cup. 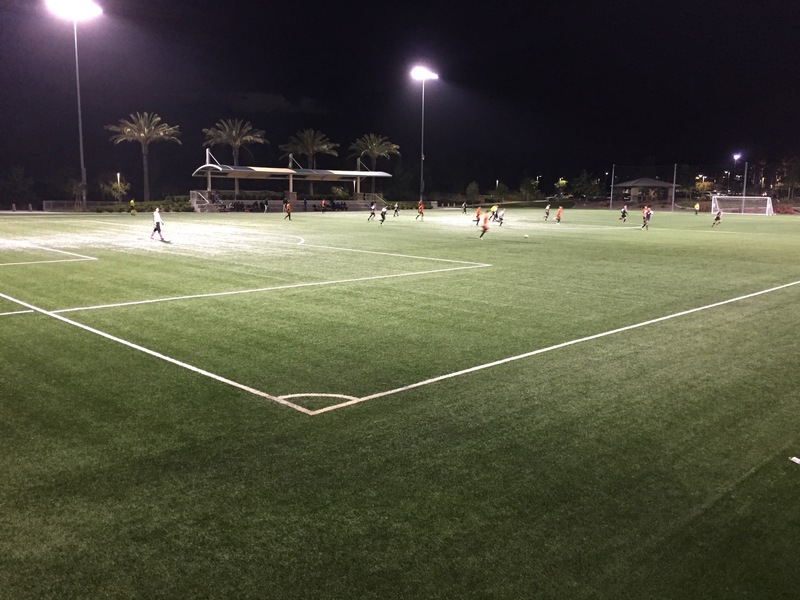 Santa Ana Winds FC topped fellow UPSL club Strikers South Coast in non-league play at Lake Forest Sports Park on Tuesday night, April 25. The match closed the third round of group play in the Cal South Adult State Cup, a qualifying tournament to the USASA National Cup. Santa Ana fell behind early in the match on a breakaway, which Strikers took effective advantage of in the 7th minute. “We tend to give up an early goal, but then we settle in and take control gradually,” said Winds FC owner Leonel López. And take control they did, coming back from a 2-0 deficit in the first half, to gradually grind and chip away, ending the first half 2-1 on a header by Andy Guerra. Winds FC were noticeably the better side in terms of ball control and dictating the pace of the match, but as is common, with more possession come more passes and a higher probability of imprecisions. Strikers took advantage of the openings they were given, making quick work of them. Winds FC continued to generate, in spite of their imprecisions leading to Strikers’ goals, by playing to their individual strengths. The Santa Ana midfield and backline consist of players able to create their own space to retain possession, and this is a common trait of nearly all their individual players. Striker Anthony Saldana dropped back into midfield to aide on Strikers attacks, displaying a versatility beyond his attacking role, while too generating space for himself going forward and achieving a high passing rate. Winds FC’s José Gómez tied things up in the 64th minute. The club showed an uptick in form after subbing in winger Omar Pérez, who created extra danger on the flanks. Santa Ana finally went ahead in the 72nd minute on a goal by Anthony Saldana. Santa Ana Winds FC have struggled to defeat Strikers South Coast in games past, but the club has managed to rebuild and gel with players from the reputable Santa Ana College Dons program. The win leaves observers identifying Winds FC as a candidate to finish atop their conference, in which they currently sit 2nd behind Strikers in goal differential, ironically. The win over Strikers FC South Coast is the latest feather in the Winds FC cap with recent wins over top UPSL sides La Máquina (January 24), LA Wolves (February 18), and Ozzy’s Laguna (April 16). Their last win over LA Highlanders at Valley Falcons Stadium at the SAUSD Sports Complex on April 22, was neither an easy task. Winds FC finished the Cal South Adult State Cup Group A with two wins, over Real Sociedad Royals and Strikers SC, and a loss at San Nicolás SC of Santa Barbara. Next match: Santa Ana Winds FC at San Fernando Valley Scorpions FC, April 29 at 6:00 pm. Venue TBA. 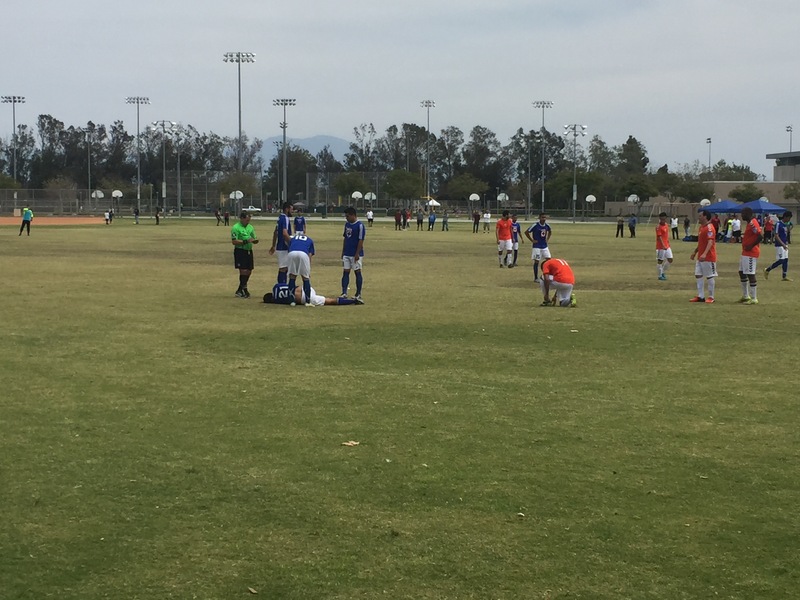 Winds FC topped Real Sociedad Royals of the So Cal Premier League on Saturday, April 8 at the Lake Forest Sports Park in US Adult Soccer National Amateur Cup qualifying. The game was tight from beginning to end, with the only goal coming on a penalty kick in the first half, called for a handball in the box. Real Sociedad Royals were maimed early in the second half, with a defender getting red carded for a tackle from behind on a goal-scoring opportunity for Winds FC. The play was setup by a through ball, in which the Winds FC striker broke through and was 1v1 with the keeper. He was stopped just outside of the 18 yard box, from behind, prompting the referee to eject the Real Sociedad defender. Winds FC hit the bar in the second half, and created opportunities but was unable to convert on a number of chances, thus relying on its defense to contain Real Sociedad. The Winds FC rival went down to 9 men in the second half after a player disputed with the referee, needing to be held physically back by fellow players, and by coaching staff once sent to the sideline. The disputed call came on a side tackle on what was interpreted by Real Sociedad as a goal-scoring opportunity, thus requiring a red card be applied similarly to the Winds FC defender. The tackle occurred near the right flank, corner edge of the 18 yard box. Real Sociedad disputed that call along with a handball in the box that was deemed unintentional by the referee. The play involved a shot on goal and a diving, outstretched Winds FC defender with arms behind him. Overall, it was a very tight match for both clubs, with Winds FC managing to inch out a win though not displaying the best football, by failing to convert chances, but creating just enough situations including a red card and penalty kick, to impact and turn the game in their favor. UPDATE: This post previously stated that La Máquina advanced in USASA National Cup qualifying. Instead, the club won its first of three matches to be played in a group stage, before going to knockout rounds. The top two finishers of each group advance. 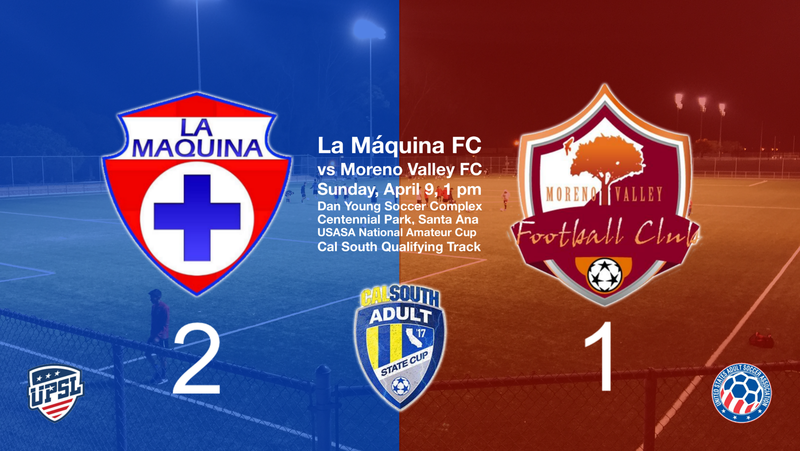 La Máquina defeated defending USASA Region IV Champion, and fellow UPSL club, Moreno Valley FC on Sunday April, 9 at Centennial Regional Park in Santa Ana in a comeback victory. 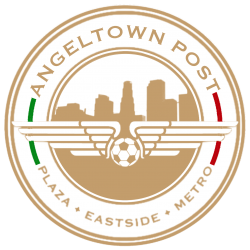 The Santa Ana-based club opted to not use one of the city’s recently renovated fields at their heavily-used Dan Young Soccer Complex at Centennial, according to league president Leonel López. “We offered to help them get a field at the complex, but they went at it alone,” said López. That decision paid off, as La Máquina opted to play on grass, on an unassuming field, but one putting the game on a rugged pitch, the type where clubs like La Máquina are forged over time. It was by design, looking in retrospect, leaving a befuddled observer like myself wondering why they weren’t on a field at the complex. They took the game to their rugged field roots, where many upcoming Santa Ana players evolve their game. It was a tight affair throughout, with all three goals coming late in both halves. Moreno Valley scored first in first-half stoppage time, on a pinballed and failed clearance in the box, after a corner kick. La Máquina, through strikers Edwin Borboa and Ronaldo Pineda, had some missed scoring opportunities in the first half. Cal State Fullerton midfielder/ striker Ronaldo Pineda came on as a sub in the first half, blasting a shot off the bar from distance just minutes after coming into the match, and unphased from the immediate, targeted tackling coming from Moreno Valley. So was the first half, a quasi-chippy one, with Máquina players getting chopped down. The second half belonged entirely to La Máquina, who saw much more possession and controlled the game that way from that point on. The club pulled the game out in under the last ten minutes, the first one on a swarm on goal, the ball looking forced into the net by sheer will. About three players converged to knock the ball in. The second goal came on a header late in the game, that sealed La Máquina’s grinded out, come from behind victory. With the win, La Máquina advances in US Adult Soccer’s National Amateur Cup qualifying. La Máquina put on a display of why they’re a tough competitor, a rival incómodo, going back to their roots, and put on a lesson in true fútbol. I sent out a few independent surveys days and months back and these were the results. I must note that no one put me up to this, but these are of my own curiousity. What I found, so far, is that using the city’s name for a club in Santa Ana is favored over using the county’s name. Should a pro soccer team based in Santa Ana use "Orange County" or "Santa Ana" in its name? When asked what names are most synonymous with Santa Ana, Winds and Saints are preferred. Of the following identifiers associated with Santa Ana, which sound better? 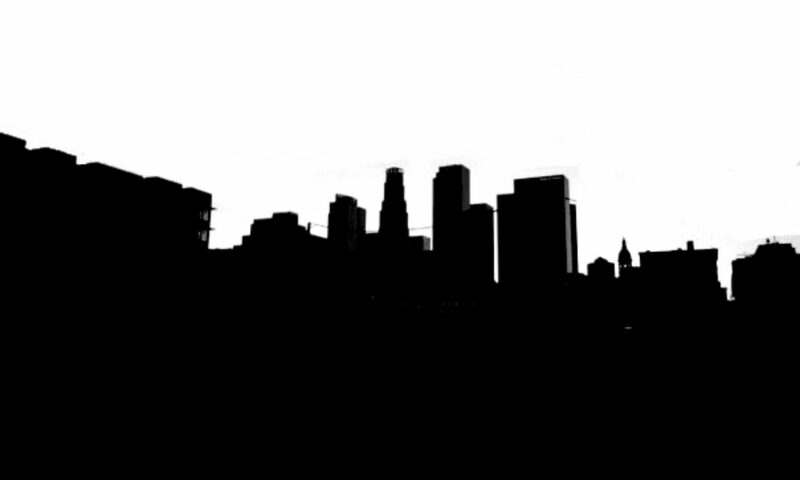 Round 2: The names Santa Ana Saints FC & Santa Ana Winds FC are in. Which of these names are most preferable? Another name put out to test was LA Aztecs, and it surprisingly got a mostly positive response. The California Surf was an NASL team that played at Anaheim Stadium in the late 70s and early 80s. They were owned by the Segerstrom family, who are longtime landowners in the cities of Santa Ana and Costa Mesa, where they developed the upscale South Coast Plaza mall. Santa Ana is nearer to Newport Beach than Anaheim or Fullerton… in fact, there was a point in time when Newport Beach was barely booming, that it was promoted as being “near Santa Ana.” California Surf fits the landscape very naturally, although the name “California” is very broad, and maybe not specific enough. The LA Aztecs played in a number of venues in Los Angeles County during their existence in the first NASL, but never called an Orange County venue home. There’s no telling how they would fare if they went the route of the former LA Rams, the current LA Angels, the former LA Blues, the current LA Kiss. These were / are Greater / Metropolitan Los Angeles- (Orange County) based pro teams. But if an LA Aztecs club were to really want to appeal to an Orange County community, Santa Ana would be a top choice, but Titan Stadium in Fullerton could work too.